Edvard Munch’s 1893 painting The Scream is a global icon—standard decor in college dorm rooms everywhere, and as merrily spoofed on T-shirts and coffee mugs as the Mona Lisa. But its very ubiquity has cast a shadow over the rest of Munch’s six decades of work, and he’s frequently, and unfairly, written off as a one-hit wonder. It doesn’t help that the majority of the artist’s work resides in Oslo in a dedicated Munch Museum. 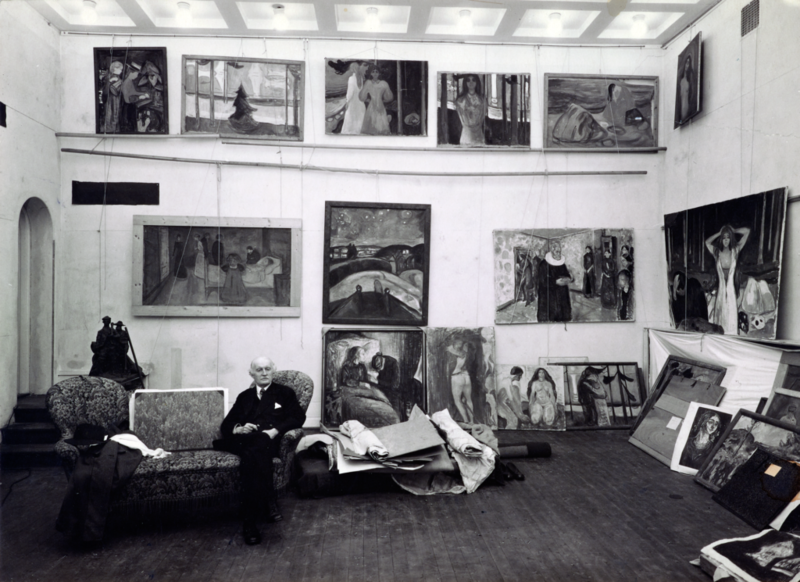 San Francisco first hosted a major exhibition of Munch’s paintings in 1951. Now, sixty-six years later, one of the greatest Western artists of all time—according to curators Gary Garrels and Caitlin Haskell, he’s right up there with Henri Matisse, Pablo Picasso, and René Magritte—is back. Garrels and Haskell have painstakingly selected approximately forty-five of Munch’s very best paintings (he created more than 1,700) and brought them to SFMOMA. Thorsen, among others, became an advocate for bringing a Munch show to the United States, specifically in the hopes of giving Norway and Munch a more prominent place on the international stage. 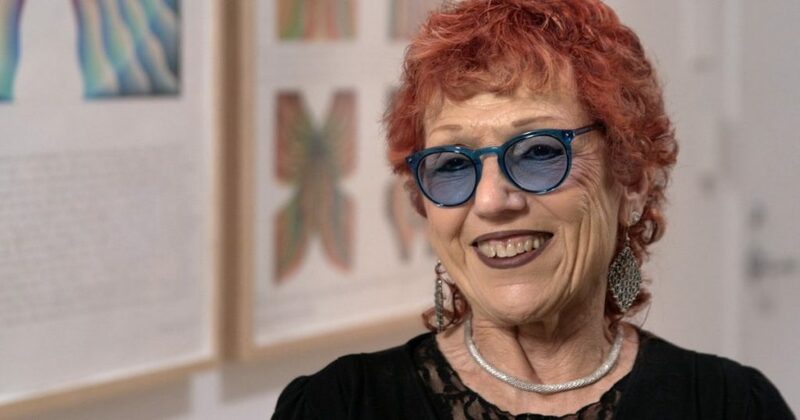 The new friendships facilitated by SFMOMA’s expansion were just one of the factors that eventually helped the Munch Museum decide they felt comfortable lending their priceless works to faraway San Francisco. 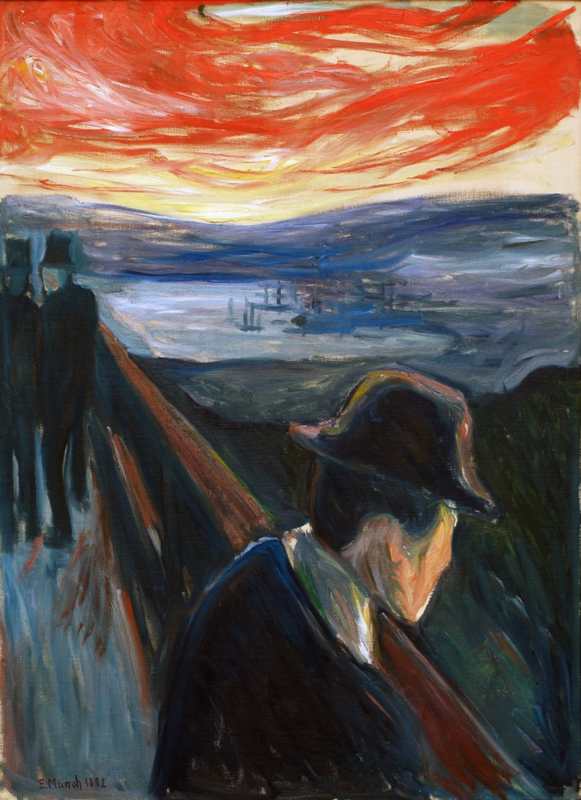 With this momentum, other major holders of Munch’s work began to follow suit, including the National Museum of Art, Architecture, and Design, Oslo, and the Thiel Gallery in Stockholm, whose collection includes Munch’s Sick Mood at Sunset: Despair (1892). While the Theil Gallery had long wanted to expand the scope of their international loans program, they only recently got the greenlight, and fortunately for us made SFMOMA the very first beneficiary of the new policy. Other lenders who rarely part with their Munch paintings include KODE in Bergen, Norway; the Gothenburg Museum of Art, Sweden; and the Statens Museum for Kunst in Copenhagen, Denmark. Thus at SFMOMA, visitors will see in one place works that would otherwise require ambitious travel throughout Scandinavia. 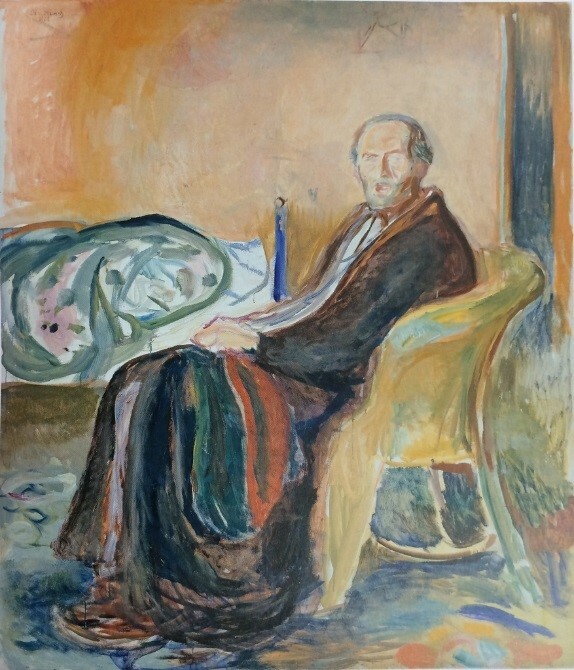 By including many works from the second half of his career, “we’re working against the grain of the prevailing idea that Munch had an incredibly inventive period of Symbolist work in the 1890s, but then subsequently wasn’t as engaged with the cutting edge of what was happening in art,” asserts Haskell. Along with co-curators Sheena Wagstaff and Jon-Ove Steihaug, she and Garrels settled on a single artwork — Self-Portrait: Between the Clock and the Bed (1940–43) — as the touchstone for a show that would not be organized around a set path (an unusual approach for SFMOMA), but rather radiate out in several directions. From that showcase piece, visitors can drift through themed rooms to witness the high points of Munch’s six-decade career. The show demonstrates the vast range of techniques Munch deployed over the course of his career. He labored over some pieces for months or years, even (notoriously) keeping them outside, uncovered, allowing them to accumulate water stains and bird droppings. He returned to many subjects again and again, either to satisfy a compulsion or because he was constantly creating his own themed groups of works, in a sense curating his own oeuvre. 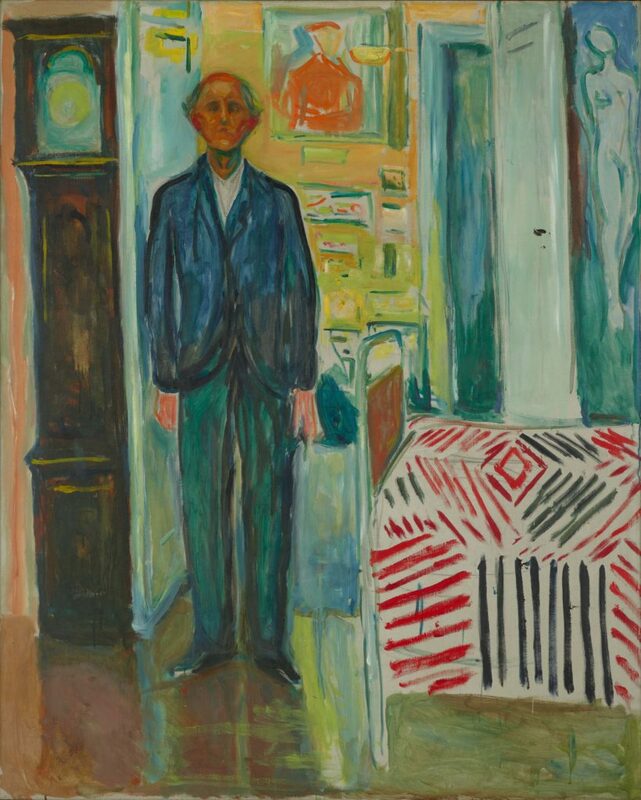 Munch moved back to Norway in 1911 and lived there until he died in 1944. Deeply concerned with how his history would be written and apprehensive about the potential dispersal of his oeuvre, he kept the majority of his new works instead of selling them. 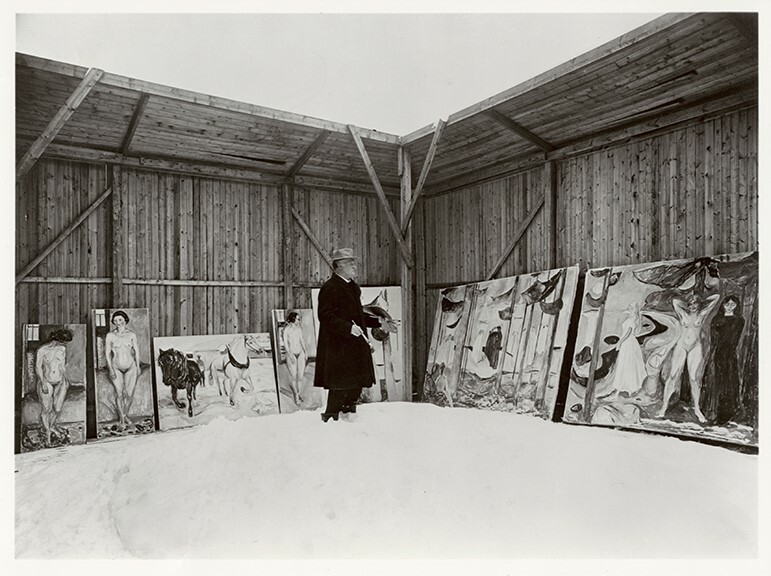 After the Nazis occupied the country in 1940, Munch worried that they might seize his works, so he bequeathed them to his home city of Oslo in the hopes that that would protect them. One famous instance, at least among Munch scholars, is Self-Portrait with the Spanish Flu (1919). To the best of anyone’s knowledge, Munch never had the Spanish flu, which claimed tens of millions of lives around the world just after World War I. But it was a dramatic and highly topical subject that affected many families in Norway, so he depicted himself sick and suffering from it. He was constantly drawn to the theatrical, the imaginary, the fantastic. Birth, death, love, and conflict, for instance, and tensions between male and female. This artist was not one to separate art from life. Haskell agrees: “Munch was interested in rigorous figuration. When you look at his work, you see that he understands material power in the same way that an abstract painter does, but he’s always working in the service of telling a story, creating a narrative structure or a figurative scene, that marries the language of making the painting with its thematics. Abstraction was never enough for him.